It’s Our Anniversary – Thank You for a Great First Year! 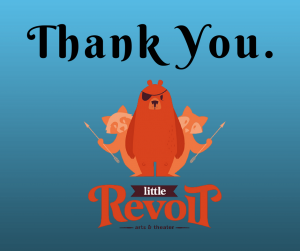 Starting a new nonprofit theater and arts organization is daunting and a lot of work, but we’re proud to announce that Little Revolt recently completed its first anniversary. A lot of people have supported us along the way, and we want to say thank you. Miami-Dade County. Some of our programs have been made possible with the support of the Miami-Dade County Department of Cultural Affairs and the Cultural Affairs Council, the Miami-Dade County Mayor and Board of County Commissioners. In particular, thank you to Roxana and Hanny. The Curtiss Mansion. Thank you to Melinda, Sherry and the Board for having the vision and willingness to explore the benefits of community theater at the Mansion. Glenn Curtiss would be proud! Dee Deringer Piquette. Dee has provided unwavering support for Little Revolt. Her work ethic and love for theater are amazing, as are her costumes. She has been a true friend, and we will be eternally thankful. Birgit and Michael Scaglione. Birgit is incredible as an artist and designer. She’s also smart and has provided an immeasurable amount of support for Little Revolt, especially during Shakespeare’s Birthday Celebration. And to Michael, thank you for helping with the May-pole music and for being such a great Glenn Curtiss, lol. Margo Acosta. Margot has been a super friend, a supporter, and a hard worker. We couldn’t have done it without you. Rick and Mary Reed. Thank you both for stepping in and providing your technical expertise and support. National Arts Strategies and the University of Pennsylvania. Thank you for helping to school us on the ways of running an arts organization. Hey, Peter, you can still sponsor our Shakespeare celebration for next year, lol. Terry Alexander, Mother Susan Keedy and All Angels Academy. Thank you for everything, too many things to name –just thank you. Jorge and Kim Calil. Thank you for being sounding boards and supporters. Ralph Wakefield and Nancy Jones. Thank you for permitting Little Revolt to access to the Pelican Playhouse’s “warehouse” of costumes. And thank you, Ralph, for a truly wonderful reading for kids on Shakespeare’s Birthday about the life of the Bard. Also, thank you for being an inspiration — for doing community theater the right way. Karen Rosson and Carol Foster. Thank you for your support and for being “game” for our crazy ideas. Carrie Segal Enterprises. Thank you for helping with our design and printing. Whitney, Eddie, Chris, Juliana, Wally. Thank you. Thank you. Thank you. Thank you. Thank you. Anthony’s Coal Fired Pizza in Doral. Thank you for the delicious food and your support. You are a wonderful community partner. Other Volunteers and Actors. There are many others who have helped out. We appreciate you. Early Donors. 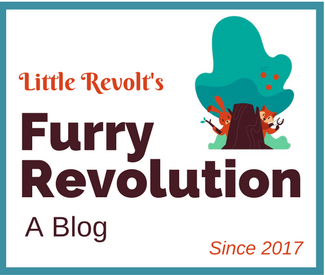 Money matters too, and I’m thankful to the folks who made the first ever contributions to Little Revolt in 2016. Carrie S, Rob G, Ralph C, Laurel W, Jorge and Kim, Esther and Ted. Stripe. Thanks to the folks over at Stripe.com, now you can register online for Little Revolt’s Shakespeare Camp — OR make an online contribution to Little Revolt — with NO credit card processing fee. Thank you Stripe for helping out nonprofit organizations and the arts. Inspiration and Education. Thank you to others who have inspired us. This will probably be a future blog post on its own, but in brief . . . Julia Perlowski, teacher extraordinaire, words cannot describe what I owe you . . . Dr. Pam Monteleone, the person who taught and inspired me to do theater and Shakespeare 25 years ago . . . Ms. X, a high school teacher (whose name escapes me) that cast me in my first play, and required me to memorize a Romeo soliloquy (which I still remember) . . . Mrs. Betty Johnson, who opened my ideas to art . . . Michelle Terl, Ann Hasenohrl, the American Shakespeare Center and the Blackfriar’s Playhouse (Sarah, Cass and Ralph), the Utah Shakespeare Festival (Michael,) the Folger Shakespeare Library, and the English Speaking Union, and W.S. Thank you all for helping us survive year one. Happy anniversary to everyone involved! I apologize if I left someone out. Congratulations on your first anniversary! I remember our first play together (The Wizard of Oz) and the many great memories in between. It’s been a real honor to work with you and be infected by your passion for creative ways to share the art of theatre (even if we do disagree on the correct way to spell theatre.) Break a Leg in year two and beyond. I know that anyone smart enough and lucky enough to be in one of your classes or productions will be changed in surprising and positive ways. It is always my pleasure to help you in any way I can. And that goes for Rick too. Don’t ever hesitate to call. Thank you, Mary. 🙂 See you soon.